Posted January 2nd, 2019 by alexa & filed under Families. 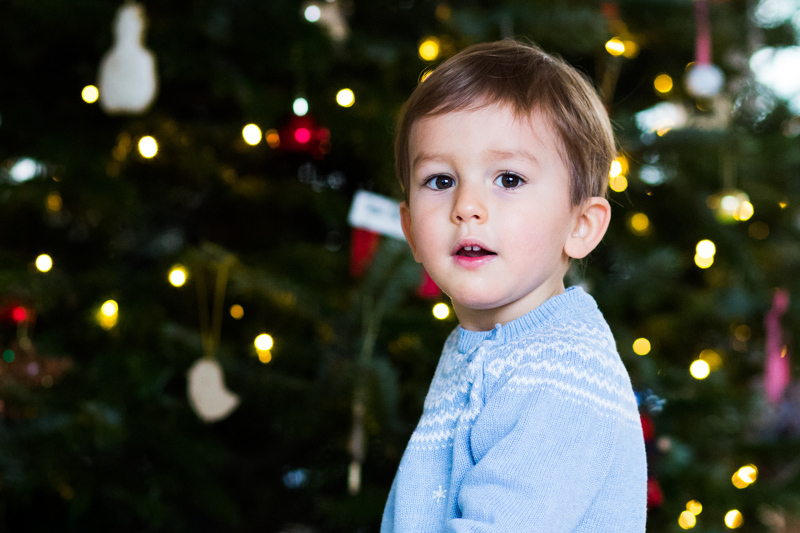 I just wanted to share a Christmas Portrait with you from a family shoot a couple of weeks ago. Although most of my family photography work is unposed and spontaneous I still love to take portraits of children. But I achieve this in a natural and relaxed way. I don’t make the child sit still for ages and say “cheese” for the camera. Instead, as in the case of this portrait, I’ll let the child play happily with their toys. I might suggest a particular location where I know the background will work well for the portrait in mind. I’m also always looking for where the light is best indoors if I’m only using natural light. Here the light was coming from a large window and it was perfect. In this instance I really wanted a portrait with the Christmas tree in the background. As this lovely little boy played happily with his toys next to the tree I just chatted with him until he looked my way. Then I clicked a few images quickly before he got back to the serious business of playing! I was so happy with the resulting photo we got. It’s festive, it’s natural and he looks happy. And “cheese” wasn’t mentioned once! Just what I wanted to achieve in this exciting time before Christmas. In this image the boy is looking directly at the camera and for me it works. But I equally love the family portraits where the subjects are not looking at the camera. Where they are engrossed in whatever activity they might be doing. And sometimes it’s great to include the toy they are playing with as well. In years to come how much will they treasure these special photos that remind them of their childhood?